In memory of Gordon Howe, who died last week of old age, rusted blades and a broken heart, 92-year-old Mary Kordie of Wayne, Mich., was being rolled toward the Joe Louis Arena in Detroit in a wheelchair and a frisky mood. It was a little after eight on Tuesday morning. A brisk wind, denying June, was blowing north across the Donald Trump Wall from Windsor, Ont., and hundreds of other, younger, men and women were bundled against the chill, waiting for the doors to open. Inside the hushed and darkened rink, a closed casket held the remains of the fallen hockey giant, weighted by a forest of Wing-Red roses and attended by three shaken sons and a daughter who will find themselves suddenly fatherless—this is the cut that cannot be stitched—come Fathers Day. The next morning, Howe was to be remembered at church by the pantheon of his balletic and ballistic sport, and his body consigned to the flames of remembrance in a cremation to rival Sam McGee’s in the mythic memory of his nation across the stream. But outside the Joe, on this unseasonable morning, there was laughter, and community, and pride. “Which one?” the old girl replied, and buckled with laughter. Kordie’s daughters were with her, and a grandson, too, all of them big Red Wings boosters, all of them harbouring sweet, personal memories of moments spent—off the ice—with Howe, who never saw himself as too all-starry to consort with common people; who never lost his inner Saskatoon. “I’m just glad he was ours,” she responded. A Michigander named Hank Forys, like many others, stood in the queue in a No.9 jersey personally autographed by Gordie and Mark Howe. He recalled talking to Mark one day about fathers and fatherhood. That Howe lived to the age of 88 was testimony to the skill of hockey’s leather-satchelled sawbones, back in the six-team days, to his own frostproof Prairie rootstock, and to the devotion of a daughter and three sons who clutched at every medical moonbeam as he declined and, by doing so, may have gained him years of life, and years for them with him. But it also was possible to look back 12 years to the time when Colleen Joffa Howe—Howe’s wife, manager, encourager and lifelong, ardent flame—was diagnosed with the rare and devastating form of dementia known as Pick’s disease, and to see this as a blow from which no man, not even No. 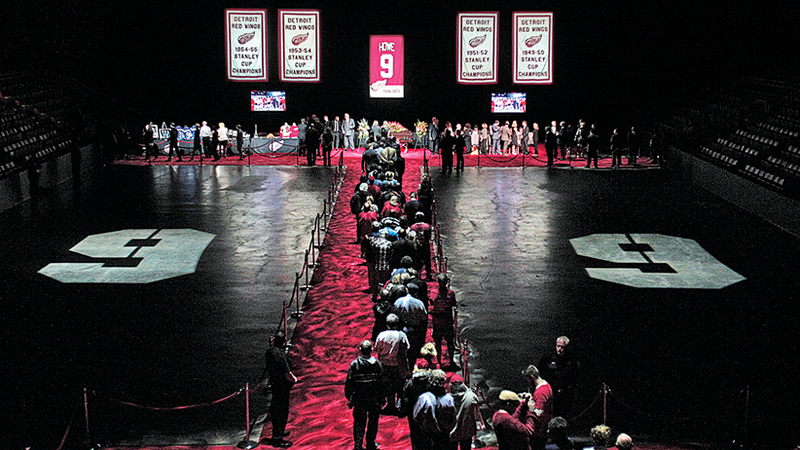 9, Gordie Howe, could recover. “A promise made is a debt unpaid, and the trail has its own stern code,” Robert W. Service wrote, and this is how hockey was to Howe, who could remember his childhood as “One pair of pants, one shirt, nine kids, a father on a tractor,” and who never could forget a slash, a slight, a stick to a teammate’s skin. He repaid those promissory notes in episodes of retributive violence, and skated away. Yet he, too, was just a man. On Tuesday, there was another mourner in the shadows of the Joe Louis Arena, a 55-year-old Canadian who remembered skating against Howe when he was 17 and the man he long had idolized was grey and so arthritic that he couldn’t grasp his stick with his right—his power—hand. Gretzky remembered being so enthralled at such a young age that he would ask for a Gordie Howe haircut, yet the source of this fealty—a hockey card? a signed stick?—was beyond his recollection. It just as easily could have been Hull or Orr or Mahovlich or Mikita or any other of the Saturday-night demigods who skated across the CBC. What would follow, of course, would become part of hockey’s, and of Canada’s, folk history: the famous photograph of Howe with a hockey stick tucked around 11-year-old Wayne’s neck at a father-son dinner in Brantford, Ont. ; the unattainable statistics amassed by the old man and shattered by the young one—“In some ways I was embarrassed to be breaking his records, but he always said it was just a number”—the bond that would place Gretzky at the side of Howe’s coffin on Tuesday in Detroit not for a bow, or a prayer, or a moment, but for 12 full hours.